MARCH 2017 • FOODSERVICE EQUIPMENT & SUPPLIES • 87 exposed brick. The same holds true with the menus, which have similar formats, yet include signature offerings unique to each restaurant's chef. "We have staples on all three menus so guests that come more frequently can order their favorite dishes," says Brienza. "Yet, our sushi rolls are different at each restaurant." One sought-after offering is Black Magic, a hakosushi or box-type sushi that includes squid ink pressed rice stuffed with fresh lobster tails, masago aeoli and scallions layered in a classic Napoleon style. Another signature item is A5- Graded Wagyu Beef, which is sourced in Nagasaki, Japan, from specially-bred cattle. "Guests can sear this beef at the tableside on hot stones," says Brienza. Another signature item at O-Ku is the Lemon roll, which has crab, avocado and cucumber on the inside, then Scottish salmon wrapped around the outside with paper-thin lemon, then pressed for a citrus blast. And the restaurant's Caronara, squid ink pasta combines candied bacon and fresh sea urchin with fresh lemon on the side. "The bacon is candied, so the lemon juice sets it off," says Brienza. But the highlight throughout O-Ku's menu is fresh fish, notably the salmon tartar. The dish incorporates a ring mold of wasabi guacamole, wasabi relish, Scottish salmon and seasoned micro greens topped with fried lotus chips. Another fish dish, Crudo, features paper-thin slices of flounder or white fish topped with extra virgin olive oil, lemon juice, sea salt and basil pesto. Emphasis is put on clean flavors, with ponzu a common ingredient. Ponzu is a citrus-flavored soy sauce that's less salty and includes truffle oil. No larger than 4,000 square feet, each of the three restau- rants seat 120 and reserve just 800 square feet for the kitchen and sushi bar. 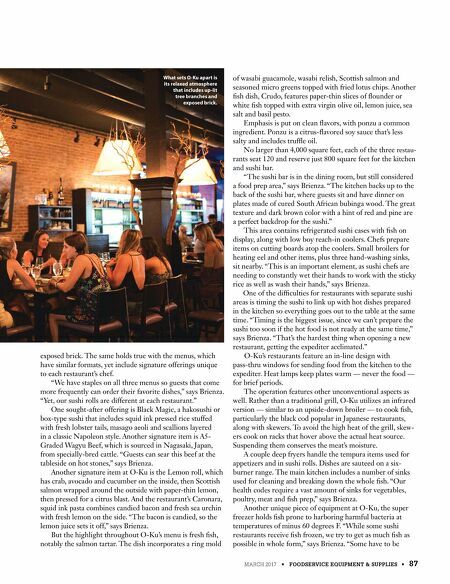 "The sushi bar is in the dining room, but still considered a food prep area," says Brienza. "The kitchen backs up to the back of the sushi bar, where guests sit and have dinner on plates made of cured South African bubinga wood. The great texture and dark brown color with a hint of red and pine are a perfect backdrop for the sushi." This area contains refrigerated sushi cases with fish on display, along with low boy reach-in coolers. Chefs prepare items on cutting boards atop the coolers. Small broilers for heating eel and other items, plus three hand-washing sinks, sit nearby. "This is an important element, as sushi chefs are needing to constantly wet their hands to work with the sticky rice as well as wash their hands," says Brienza. One of the difficulties for restaurants with separate sushi areas is timing the sushi to link up with hot dishes prepared in the kitchen so everything goes out to the table at the same time. "Timing is the biggest issue, since we can't prepare the sushi too soon if the hot food is not ready at the same time," says Brienza. "That's the hardest thing when opening a new restaurant, getting the expediter acclimated." O-Ku's restaurants feature an in-line design with pass-thru windows for sending food from the kitchen to the expediter. Heat lamps keep plates warm — never the food — for brief periods. The operation features other unconventional aspects as well. Rather than a traditional grill, O-Ku utilizes an infrared version — similar to an upside-down broiler — to cook fish, particularly the black cod popular in Japanese restaurants, along with skewers. To avoid the high heat of the grill, skew- ers cook on racks that hover above the actual heat source. Suspending them conserves the meat's moisture. A couple deep fryers handle the tempura items used for appetizers and in sushi rolls. Dishes are sauteed on a six- burner range. The main kitchen includes a number of sinks used for cleaning and breaking down the whole fish. "Our health codes require a vast amount of sinks for vegetables, poultry, meat and fish prep," says Brienza. Another unique piece of equipment at O-Ku, the super freezer holds fish prone to harboring harmful bacteria at temperatures of minus 60 degrees F. "While some sushi restaurants receive fish frozen, we try to get as much fish as possible in whole form," says Brienza. 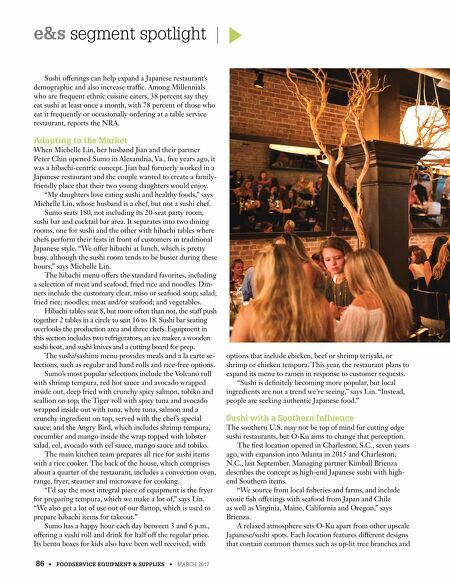 "Some have to be What sets O-Ku apart is its relaxed atmosphere that includes up-lit tree branches and exposed brick.